Wondering what to give your mom this Mother’s Day? There are tons of Mother’s Day gift ideas that you can search in Google websites, ranging from clothes, jewelry, womens’ wear accessories, home electrical appliances to the most commonly traditional gifts such as flowers and a dinner treat which definitely would not fail to impress our mom’s happy face. Mother’s Day doesn’t indicate that it is specially celebrated for mothers only. 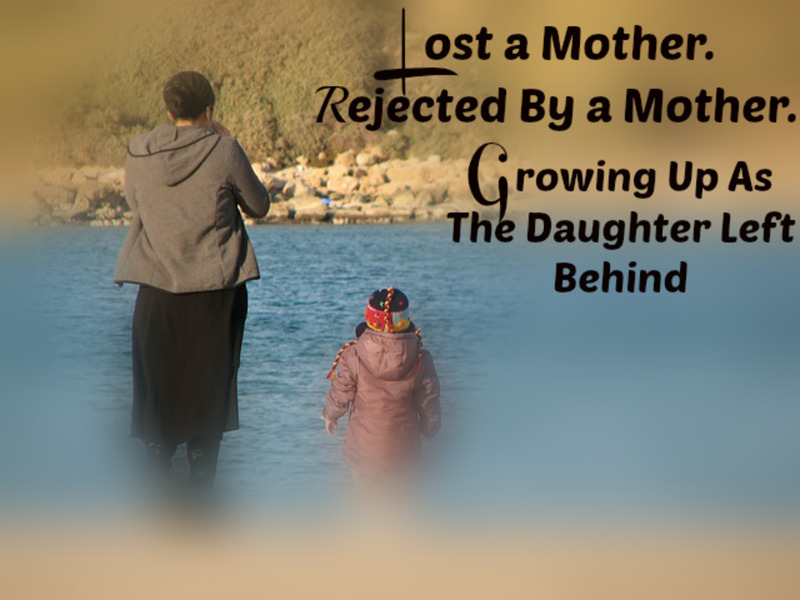 the woman who had been your pillar of life since you were born ( if you are an orphan ). What did you gave your mother last year on Mother's Day? Nothing! Gave her a hug and lots of kisses. Gave her a store bought gift which cost a hole in my wallet! Gave her a handmade gift that I made on my own. She was thrilled ! Bake a cake / cookie / muffins for her. Had a great time together. Handmade giftsvs Store bought gifts? This year, Mother’s Day will be held on 10th may, 2015 which is a routine occasion that always fall on the second Sunday , the month of May. This year, do consider making a handmade personalized gift for your mom instead of purchasing store bough gifts. A handmade gift is a beautiful way to express your love and appreciation for your mother’s love, sacrifices and guidance that she had showered since the day you were born. Since Mother’s Day is fast approaching, here are some unique handmade gift ideas that you can make them at the comfort of your home. I am sure every mom would be happy to receive these handmade Mother’s Day gifts with open arms especially when she knows that they were handmade by you or your kids. Put in some effort together, arrange your spare time, gather all the required materials and don’t give up easily because these gift ideas are simple and easy to make without taking much of your time. If you are interested to learn more about a particular handmade craft idea, kindly click onto the link provided in the source box that will lead you to the author’s website. Majority of these handmade Mother’s Day gift ideas are suitable for other occasions too; such as Valentine’s Day, International Womens’ Day, Birthdays and Christmas Day, just to name a few.. If your mom loves fragrance smelling flowers, I am sure she will fall in love with this Lavender Heart Sachet at once. 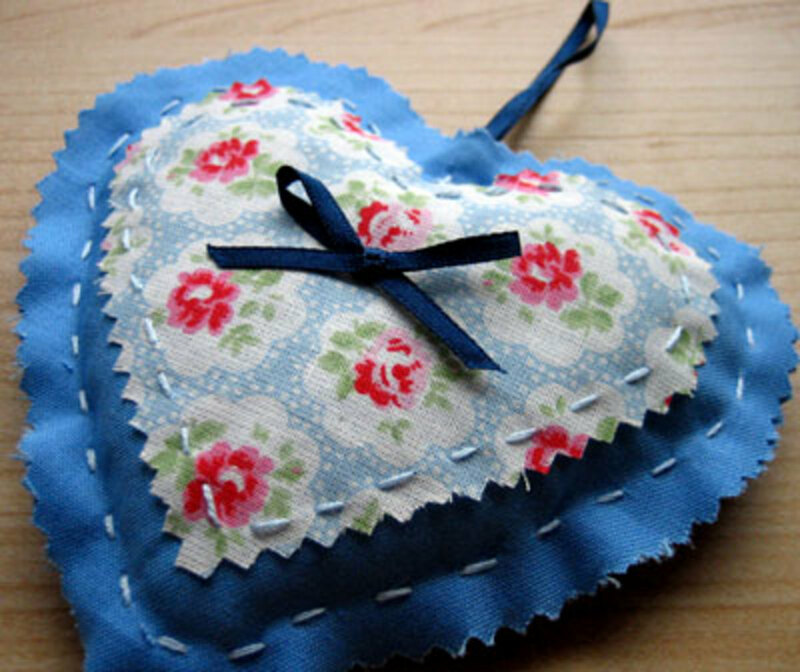 I just love the author of this website; www.homemade-gifts-made-easy.com, who had hand sewn a beautiful blue color heart sachet filled up with dried lavender that she had grown and dried. This sewing project is easy to make especially for those who are sewing beginner. You need not have to use a sewing machine as it requires hand sewn with just a few simple steps. Normal "dash" stitches will do. These Lavender Heart Sachets is a perfect gift for Mother's Day, Valentine's Day or even Birthdays. In order to keep them for spare gifts just in case a special occasion is around the corner, make 2 or 3 of these fragrant scent sachets and seal them in a sealer plastic bag so as to "lock" the fragrance inside the bag. If you are worried that the lavender fragrant scent might ward off, don't fill in the dried lavender until you need to give the Lavender Heart Sachet as a gift to your special someone. It looks great hanging on a doorknob, handbag or leave it on the desk to fill up the room with fragrant lavender scent. This is another sewing art project idea for Mother's Day. You could either use a sewing machine to sew the straight lines pretty fast or hand stitch them as I did since I don't own a sewing machine. Embellished Dish Towels is actually a combination of plain color dish towel with a strip of pattern design fabric which has the length that is long enough to cover up the width of both sides of the dish towel. Choose you mom's favorite color. You can retrieve the fabric from old clothes or handkerchief so that you don't have to purposely purchase the fabric from fabric stores. As for the dish towel, buy those "Good Morning" facetowels which are sold in a bundle at a very low price. Alternatively, "borrow" the towels from your mom and quickly hand sew the fabric before she notices the disappearance. By the way, as the author of hardlyhousewives.com had suggested, remember to wash the dish towel and the fabric before sewing as these cloths will pre-shrunk when you start your sewing project. 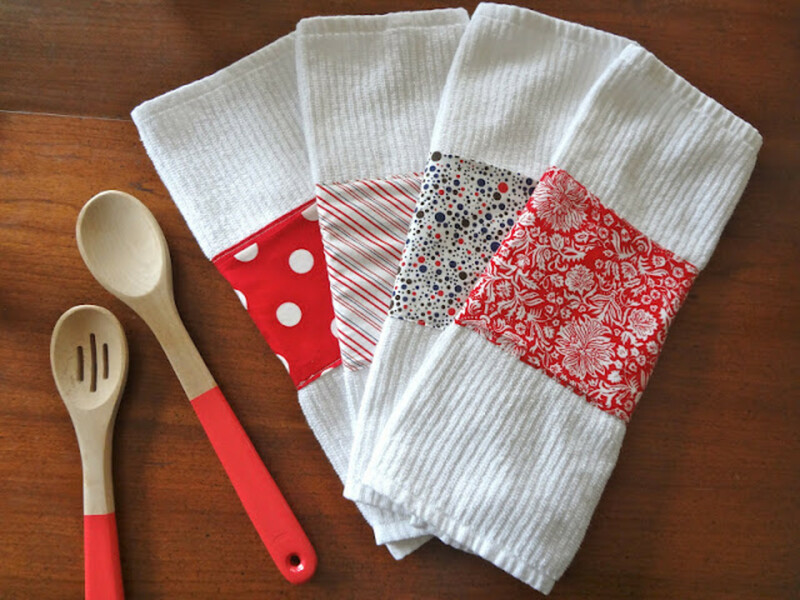 Once you had sewn the dish towels, put them into a box that fits nicely, attach a handmade Mother's Day Card on the top cover and tie a ribbon which I believe would make this handmade gift extra special. Cost you nothing at all. Who doesn’t appreciate flowers? What about flowers in a watering can to replace the glass or ceramic vase? I just love this handmade gift idea from http://www.u-createcrafts.com. 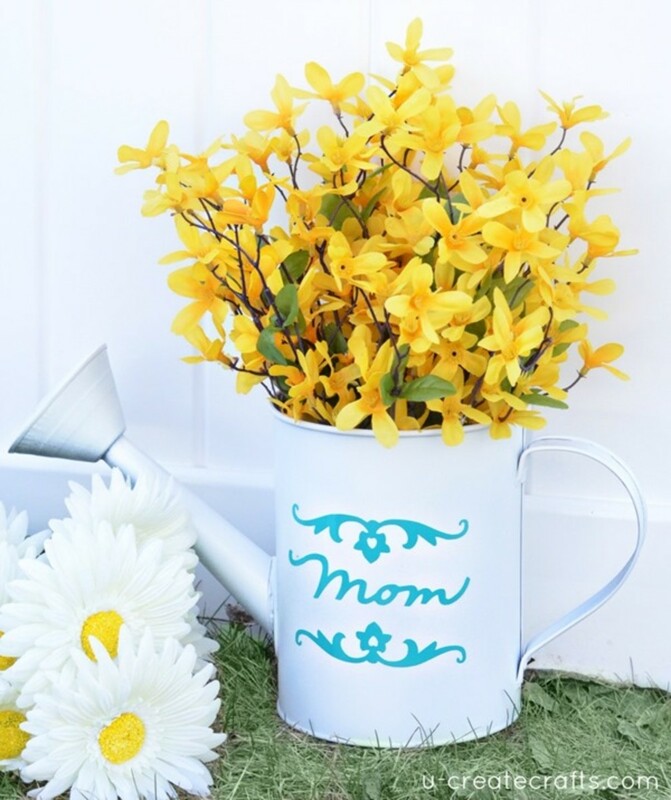 A unique gift idea that you can recycle your old watering can and milk tin or plastic container into a beautiful Mother’s Day gift for your mom. If the watering can is rusty or the color has worn out, coat a new paint or hand spray the can with bright color or better still, your mother's favorite color. Next, with a Cricut, vinyl the word "Mom" or "Mother" or "Grandma" with unique patterns. Allow the hot sun to dry the watering can before you cut fresh flowers from your garden. Since I don't have fresh flowers but weeds and leaves in my garden, I bought some plastic flowers from the Thrift store, a bouquet of carnations at a very low price. Arrange the flowers nicely in the plastic container or milk tin and insert it into the watering can. Make a date with your mom and hand her personally your handmade Flower Vase which will definitely and positively brighten up her smile. Do you have a spare cushion pillow at home? Care to give it a special decorative pillow for your mom as a Mother's Day gift? Well, start removing all those fancy and colorful buttons from your old clothes, kids' clothes and search for a pink felt cloth for the heart. I was awed to stumbled upon http://handmade-website.com, which the author had made a bright and colorful buttons on the pillow. As for the pink ribbon, retrieve it from your daughter's old dress, I am sure you could find one. The ring is actually not a compulsory item but you could replace it with a pendant or keychain instead. Choose a plain color cushion pillow cover, either dark or bright color and make sure that the cover is wash and dried under the sun. You wouldn't want your mommy to hug a bedbug or dusty pillow right? personally, I would put the cushion pillow under the hot sun before start the sewing art project. Alternatively, you could buy a new cushion pillow if you are worried about the bugs. This decorative pillow is a very simple art project. 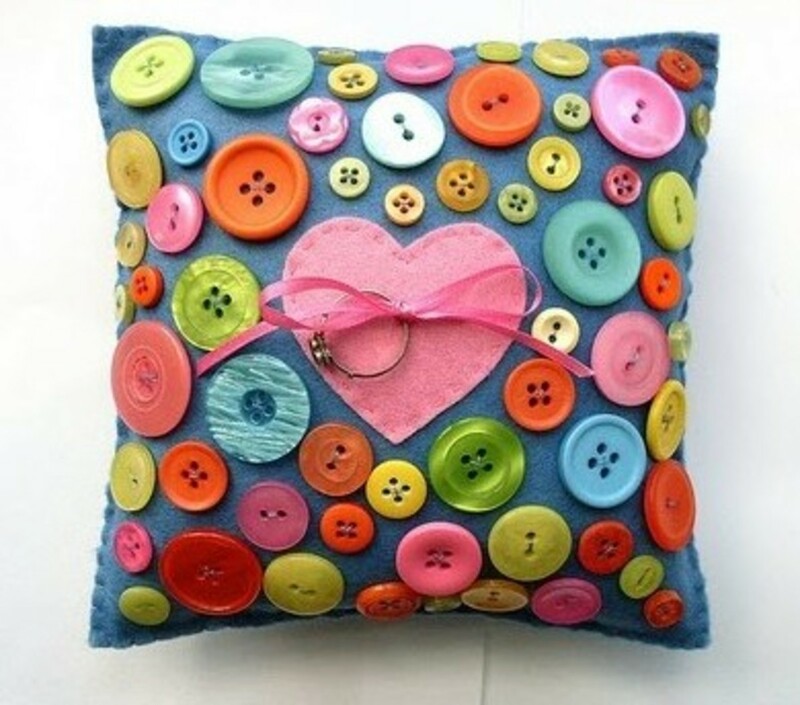 Just hand sew a felt heart in the middle of the pillow cover and sew different sizes, shapes and colors of buttons all over the front cover. There are some great handmade Mother's Day cards out there in the stationary shops and tons of websites with authors handmade cards ideas. Of all the cards I had seen, I love Martha Stewart Mother's Day Pop-Up card which was fascinating, using construction papers and glue. This beautiful and elegant pop-up flowers could make up an excuse for you for not giving your mom fresh flowers because paper flowers could last longer and stay pretty for years ahead. 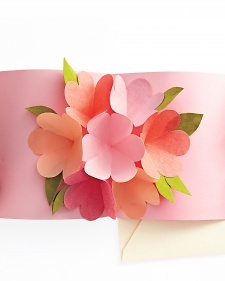 When you mother opens up this handmade Mother's Day card, it blooms into a three dimensional flower arrangement that is far better than a vase of fresh carnations. I love the way the flowers blooms beautifully when I open up the card and when I close the card, one could hardly know that there is a bouquet of flowers inside it. 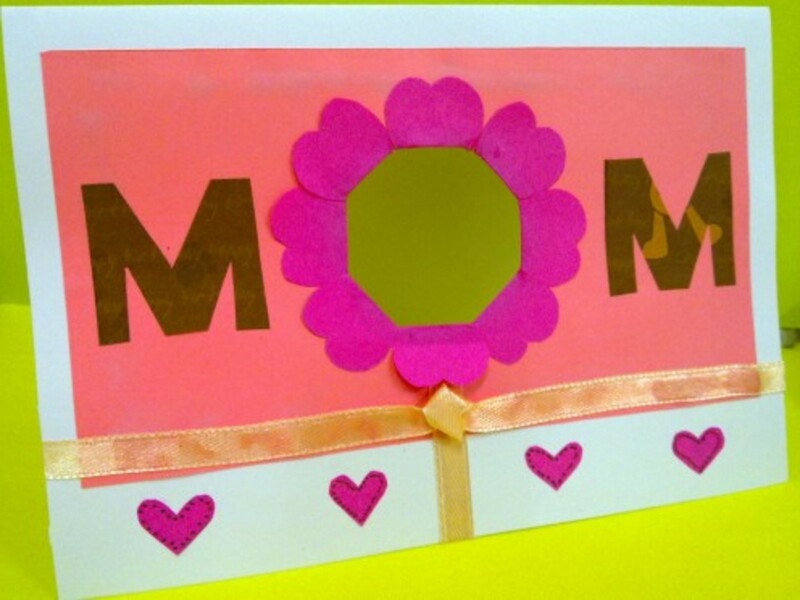 Although this Mother's Day Pop-Up Card may look complicated at first glance, with the video , I am sure you could achieve the project in a short while. I just love these ideas. I am always looking for homemade gift ideas. I will definitely be using the embellished kitchen towel idea. Love the decorative pillow. The buttons were well chosen. I like the Mother's Day pop-up card. I will be back to make one for my mother this year. Great stuff from you, man. Ive read your stuff before and you're just too awesmoe. I love what youvegot here, love what you're saying and the way you say it. You make it entertaining and you stillmanage to keep it smart. I can't wait to read more from you. This is really a great blog. Very easy and great ustom gifts for all mothers. yeah, i love the pillow buttons too. Unique and wonderful to decorate on the sofa. You sure are lucky to receive handmade gifts. Wonderful ideas for Mother's day gifts. Great ideas ... I love getting and giving handmade gifts. Great ideas. All moms will be very happy with your ideas. They all look so beautiful. Thanks for sharing. Voted up. I love the button pillow, that is a keeper for sure. It is also unique enough to become a conversation piece over the years. I love gifts that tell a story. Lovely hub. Thank you. Thanks for reading. Yes, the person who makes the handmade projects really put all the effort, time and concentration into it. I AM !! Nice gift ideas for Mother's Day! I always like handmade projects :-) Handmade projects mean that the person took the time to create it and time is love. Thank you for sharing! Many thanks my friends. Am very happy that you are so supportive to my hub. Appreciated with thankful heart. These are some really cool ideas for a Mother's Day gift, voted up, more and shared. Great Ideas... It will surely help those who are confused for giving gifts to their mother. These are beautiful gift ideas, peachpurple. Very creative. Thanks for sharing!